“Companies have an important role to play in reaching gender equality, and we will benefit when they succeed. A fairer, more inclusive workplace is good for all employees, and more diverse companies produce better results. Advancing women is not just the right thing to do; it's the smart thing to do,” - Rachel Thomas, Co- Founder & President of The Sheryl Sandberg & David Gold berg Family Foundation. The Lean In network is continuing to go from strength to strength, with the ongoing success of the women leadership empowerment network being celebrated at an event in Belfast later this month. Nuala Murphy, entrepreneur and CEO of Moment Health brought the international organisation to Northern Ireland four years ago, and it's grown to over 2,000 members since its inception here. Lean In supports women via "circles," small peer groups that meet regularly to learn and evolve together. The group's numbers have grown massively in the past 10 months, with over 30 circles across many sectors including entrepreneurship, creative industries, finance, and tech. This pheromonal rise in members locally has led to a special event being held at the Ormeau Baths Gallery on 26 November, which will include a toast to new circle leaders and will introduce new members to the group. This growth is a huge leap from the five circles that existed at the beginning of 2018. "Now with 30 circles supporting leadership and development the Northern Ireland female-driven Lean In network works to support and encourage positive networking across genders," states founder Nuala, "The Belfast celebration event, in partnership with Barclays, will also offer members time to learn from their peers across the Lean In ecosystem." This celebration is also an opportunity to look forward and plan for the future of Lean In within Northern Ireland. Nuala Murphy will introduce the new leaders who have come on board at the event and detail the impact that Lean In has had locally amongst the community. "Four years ago, I didn’t expect Lean In to take off the way it has..to be hosting this event, with Barclays, shows that the concept and the idea was not only successful but is something that has momentum and will build yet further," she explains. Adrian Doran, Head of Corporate Banking for Barclays in Northern Ireland, will additionally be speaking at the event, discussing how Barclays achieved its position in The Times Top 50 Employers for Women. New and existing members are more than welcome to join, and for those that join Adrian believes that Lean In is "more than just a network. It has given women a voice to join forces to support each other. 85% of circle members across the world experience career advancement, pay rises, increased confidence and inspiration”, as a result of joining the network. At the event, there will be a panel discussion with five of the new Lean In Circles’ leaders and a question and answer session to allow delegates to explore their own plans for personal and business development. 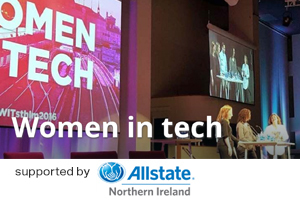 To attend the Lean In Belfast End Of Year Celebration go to bit.ly/LeanInCelebration to secure your place.